With thanks to HarperCollins 360 for the copy of this novel! As always, my reviews are non-bias and fair. I had heard so many great things about Joyce Maynard's novels, through bloggers and friends on Goodreads, but had never read anything from her until now. I also heard about it on Twitter, about the film adaptation; and there's nothing better than seeing a novel portrayed on the big screen. So I was very excited to get started reading! 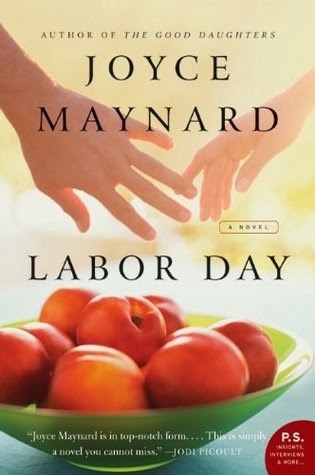 The first thing I knew when I started reading Labor Day was that it was a story that, not only did the plot grow slowly and strikingly intriguing as the story progressed, but that it was far more than some story about a 13 year old boy and his mother. It was a powerful and touching coming-of-age novel with unexpected turns of events and discoveries. It was a simply life-altering way of looking at things, and at looking at each other. Henry, the narrator of the story, has taken on the role of being responsible while his mother; Adele, is depressed and taken aback by the reeling of her divorce and the breakdown of the family dynamic. But soon enough, the dynamic changes all together. When Adele and Henry both leave the house together, which is a rare occasion, they meet a man who changes things all together. He is hurt, and so they take him back to the house where they progress to find out his secret. He's not the disguise he wears as his uniform. He is actually an escaped prisoner and hurt himself escaping through a window; Frank. The man who would change their lives forever. Things don't go as they should. In fact, throughout the novel as the three spend more time together and start to change each other, I started to see them in a different way as I first perceived them, which roped me in just that little bit more. The plot was unpredictable, complex and at times when the actions of the characters would've seemed foolish, it felt more insightful instead. The way Frank is with Henry is particularly interesting because of the way he introduces him to the ways of life, love and the real world. I felt that Henry learnt a lot from Frank's own youth, too. He also changes Adele, who even when she was isolated, he brought out a spark in her that must have felt like a breath of fresh air to her. I think it was because secrets were a big subject in the plot, and it felt like similar ground for the both of them. Although I am a Young Adult reader 90% of the time, this felt similar because of the younger narrator, though the issues and subjects were more adult-like. Labor Day was a perfect afternoon read that started off as a few pages, into reading the book in a day. Still, after the pages were closed, the thoughts of the books remained in my mind. And *that* is rare, something you don't find in every book out there. Labor Day was powerful, blissful and quirky. Overall, an undeniably amazing read that I would recommend so highly. Definitely a favourite Adult read of the year. Have you read Labor Day? This looks wonderful, I've added it to my to-read list on GoodReads!